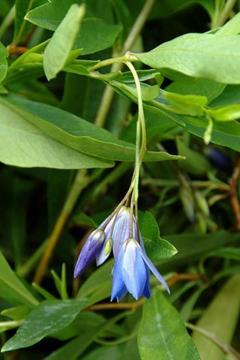 Evergreen twining climber with narrow mid to dark green leaves and nodding bell-shaped blue flowers during summer, followed by blue berries. Half-hardy, needing protection from hard frosts. Moist, well drained lime-free soil, with some shade from strong direct sun. Best grown in a conservatory or greenhouse although reputed to be hardy in some favoured parts of southern Britain. From seed, which can be slow to germinate.